Today is World Bread Day, and Zorra is hosting submissions from all over the world. For those of us who love to bake bread, this is an exciting event because we get to see a bevy of breads that inspire us for months to come. I decided to try my hand at an Irish Porridge and Oatmeal Bread from King Arthur Flour Whole Grain Baking: Delicious Recipes Using Nutritious Whole Grains. 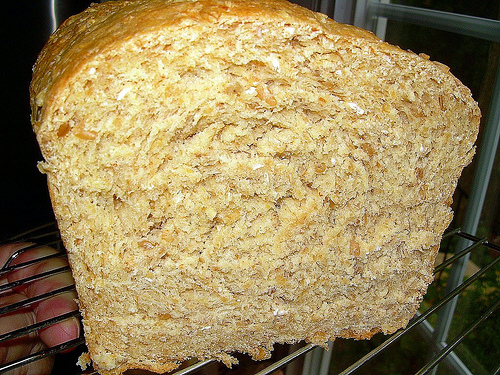 This bread fascinated me because it used both steel cut oats that I had to soak overnight, and old-fashined rolled oats, not to mention powdered milk and vital wheat gluten. When the dough was rising, my husband asked me what I was making that had beer (!) in it. No beer, but the earthy aroma of the bread filled the kitchen. The result was a dense, flavorful, toasting bread that’s great with butter and a cup of tea. I would not recommend this bread for sandwiches, though; the texture is wrong for that. After experimenting with the bread for a bit, I have some tips. First, if you have a baking stone, set the loaf pan on the stone. Second, preheat your oven a good 30 minutes (at least) before baking. Why? My first loaf, even after an hour in the oven, was a bit raw in the middle! I realized that I had been too busy to preheat my oven as long as I usually do, and when I make dense loaves, I usually shape them into boules or batards and bake them directly on the stone. Thus, no rawness. Be sure to check Zorra’s blog for a roundup of breads on October 24-25. This bread has been Yeastspotted! Recipe after the jump. continue reading "Irish Porridge and Oatmeal Bread for World Bread Day"